Emi Mahmoud performing at the Trust Conference 2017. Emi Mahmoud, a Sudanese-American slam poet, performing at the Trust Conference 2017. The conference is organised by The Thomson Reuters Foundation (TRF), the philanthropic side to Thomson Reuters, the renowned worldwide multimedia source. 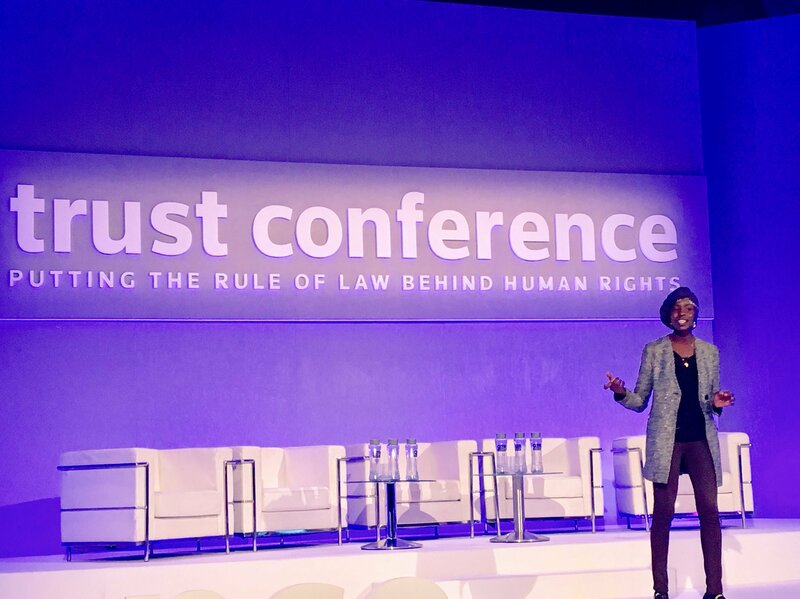 Changed this year from Trust Women Conference to simply the ‘Trust Conference’, CEO Monique Villas was at pains to reassure attendees that the new name did not mean that they no longer considered women’s issues important. ‘This year’s agenda is testimony to the fact that women’s rights are front and centre of what we do,’ she remarked in her welcome address to the 600 delegates. From a Survivor’s Panel on day one to the second day titled simply ‘Empowering Women’, the Trust Conference gave autonomy, freedom and a platform to marginalised and overlooked women across the world. We heard from regions Bahrain, North Korea, India, the US and the UK. All women who have fought to survive and to help others alongside themselves. Civil society looks to be weakening at every turn. Chinese lawyer Cheng Guangcheng spoke of the tyranny of his country’s political party, and the impunity with which they deny women reproductive autonomy through population planning clinics. Speakers from both the US and Bangladesh commiserated on corruption within power structures, and the lack of enforcement within sexual exploitation and chronic poverty. Global stories were prevalent, both shockingly told and achingly similar. Where there is denial on an institutional level, the system keeps repeatedly failing. The heartbreaking stories of individuals – both as survivors and workers on the frontline – jarred somewhat against a panel where corporations assembled to talk about the role of business in eradicating forced labour. The TRF have long been outspoken in their desire for nonprofits, governments and businesses to all address modern slavery. Apple were on the panel, making this conference the first time that they have spoken publically on supply chain issues. However, with a quarterly revenue of $52.6billion, and Walmart, another panellist, with a 2017 revenue of $485.9billion, it did gloss over the humanitarian consequences to such industrial corporate wealth. ‘One question that should have been asked [then] – how much are Walmart paying their employees?’ spoke Maryam Al-Khawaja, a human rights defender from Bahrain at a panel the following day. Philanthropy and media are increasingly entwined, even as the ill-defined and uneasy boundaries blur and shift. 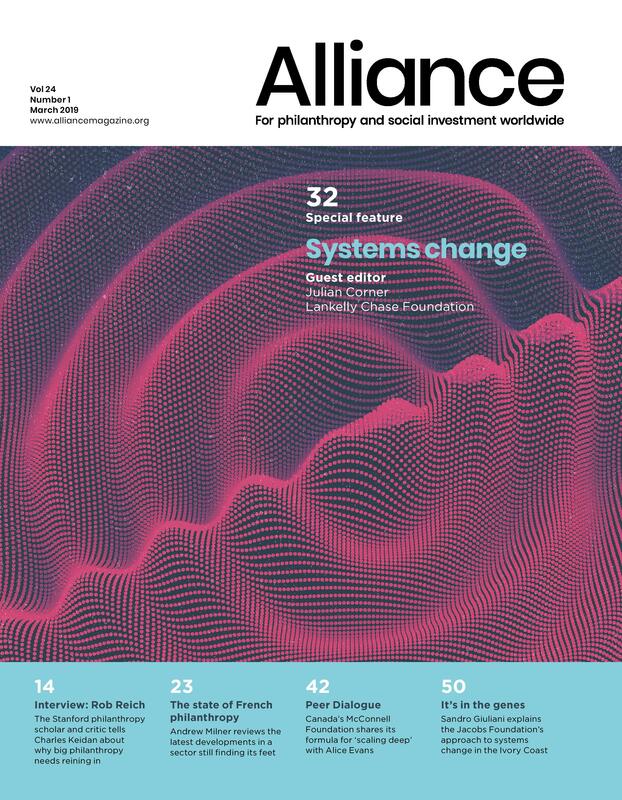 As explored in-depth in Alliance‘s December issue, philanthropy’s role in bringing news and awareness to the public requires trust and healthy civic engagement. Foundations like TRF, and the events they hold, battle to show human stories behind data points and statistics. It’s important to remember the stakes when discussing shrinking civil space, and the very real and damaging impact that has on human, and especially women’s, lives. Women don’t need saving – they need their truth to be supported and to be heard. Shining a light on institutional oppression through trusted news, means the process of learning and witnessing can inspire the act of change. Saying things out loud is truth to power. Amy McGoldrick is Alliance’s Marketing and Advertising Officer.